Coming from behind wasn’t an issue for the Wild in recent games, when it found a groove to win five in a row. The team’s rhythm hit a snag Thursday, as it blew an early lead and failed to rally en route to a 5-3 loss to the Coyotes at Gila River Arena, but it’ll have a chance to rebound Friday as it closes out this brief two-game road trip in Colorado against the Avalanche. The Wild did not skate Friday morning in Denver; coach Bruce Boudreau will address the media at 6 p.m. Central time. It wouldn’t be surprising if he mixed up the forward lines after the team’s win streak ended. Perhaps, then, forward Luke Kunin plays his first game since the team recalled him from the American Hockey League Tuesday. In 36 games with Iowa, Kunin had 19 points (10 goals). During his previous look with the Wild this season, he chipped in two goals and recorded four points in 17 games. 12-4-1: The Wild’s record against the Avalanche in the last 17 matchups. 51: Goals for the Wild in those games compared to 31 to Colorado. .931: Save percentage for goalie Devan Dubnyk in 28 career starts against the Avalanche. 4: Points for center Matt Cullen in the past six games. 22-8-1: Colorado’s record on home ice. Colorado is only a point out of the second wild-card position in the West after going 5-4-1 in its last 10 games. The team is in the midst of a four-game homestand and has won the first two contests – outscoring the opposition 8-3. Center Nathan MacKinnon continues to pace the Avalanche offensively; he has 29 goals, 42 assists and 71 points. The Avalanche is 1-0-1 against the Wild this season. 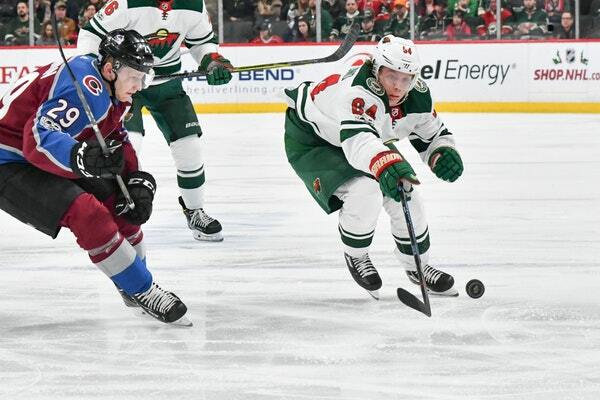 Captain Gabriel Landeskog has recorded 22 points in 31 career meetings with the Wild.